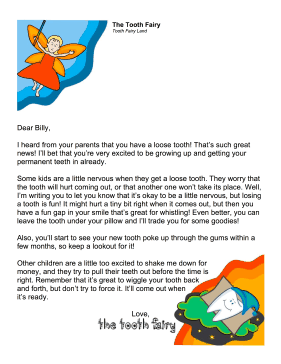 Assuage a child's fears and promote excitement about a child's new loose tooth with this printable tooth fairy letter. I heard from your parents that you have a loose tooth! That's such great news! I'll bet that you're very excited to be growing up and getting your permanent teeth in already. Some kids are a little nervous when they get a loose tooth. They worry that the tooth will hurt coming out, or that another one won't take its place. Well, I'm writing you to let you know that it's okay to be a little nervous, but losing a tooth is fun! It might hurt a tiny bit right when it comes out, but then you have a fun gap in your smile thats great for whistling! Even better, you can leave the tooth under your pillow and I'll trade you for some goodies! Also, you'll start to see your new tooth poke up through the gums within a few months, so keep a lookout for it! Other children are a little too excited to shake me down for money, and they try to pull their teeth out before the time is right. Remember that it's great to wiggle your tooth back and forth, but don't try to force it. It'll come out when it's ready.